Hello and welcome to Quietfire Creations Blog! 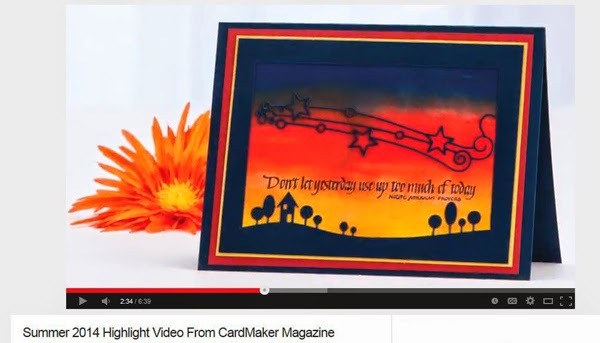 Jutta here and today I have a Note Card project to share with you. stamp set both from Quietfire Design. it also holds a paper insert inside. To make my card I started by stamping the Hydrangea in LT BL Dye ink on a 4”x5-1/4” WT cardstock panel. Coloured the flower with markers. Sponged LT BL Dye ink randomly to the back ground and all around edge of panel. Using YL glitter pen I squiggled a line all around the panel then again with a LT BL fine tip marker. Added some definition to flower with a BLK fine tip marker. Stamped the sentiment and the Dragonfly in Jet Black Archival ink. Added a few dabs of YL glitter pen to flower. Adhered the panel to the card base before adding embellishments to complete. 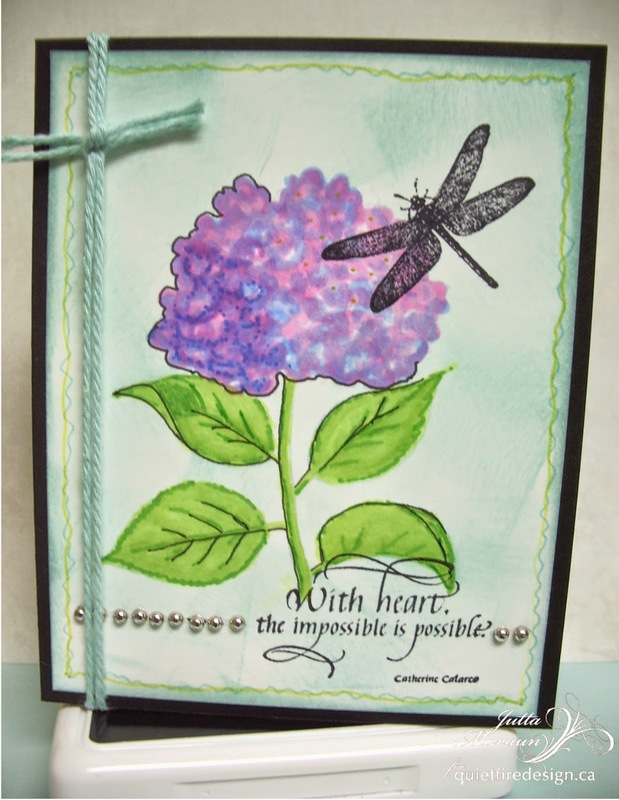 Stamps –Quietfire Design, With Heart Anything is Possible and Sm Dragonfly from the Butterflies / Dragonflies set. -Hero Arts, Hydrangea. Cardstock –Stampin Up! (Black), Copic Stamp and Illustration paper. Thanks for your visit and I wish you all a crafty day! Hello All! 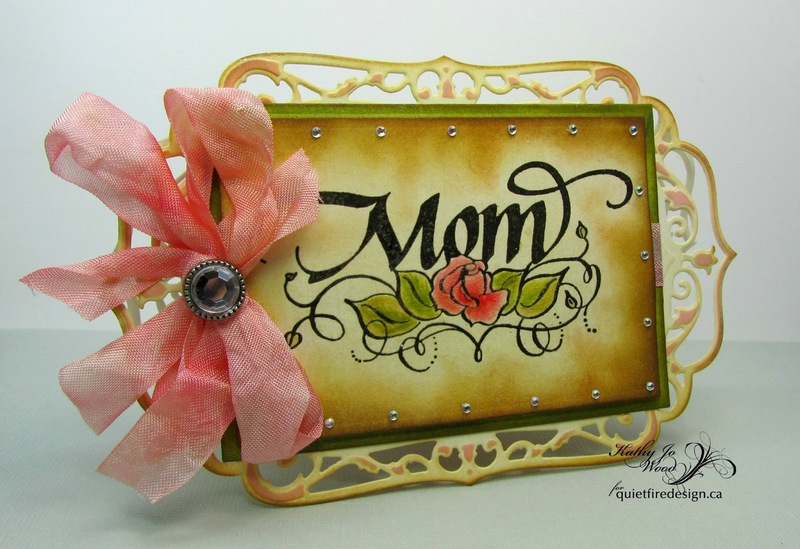 Kathy Jo here to share a shaped card using the beautiful Mom Floral Ornament stamp from the new stamp set Keep Calm & Call Mom. 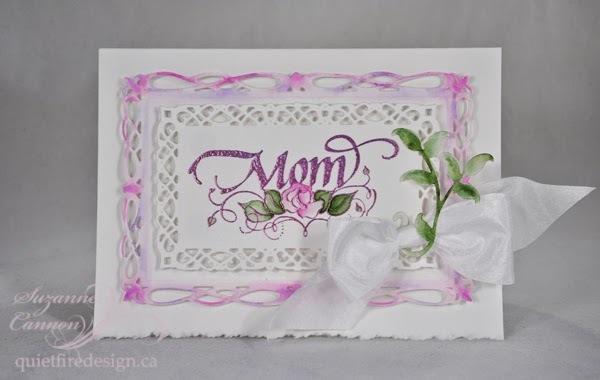 The Mom Floral Ornament stamp was heat embossed on ivory paper. 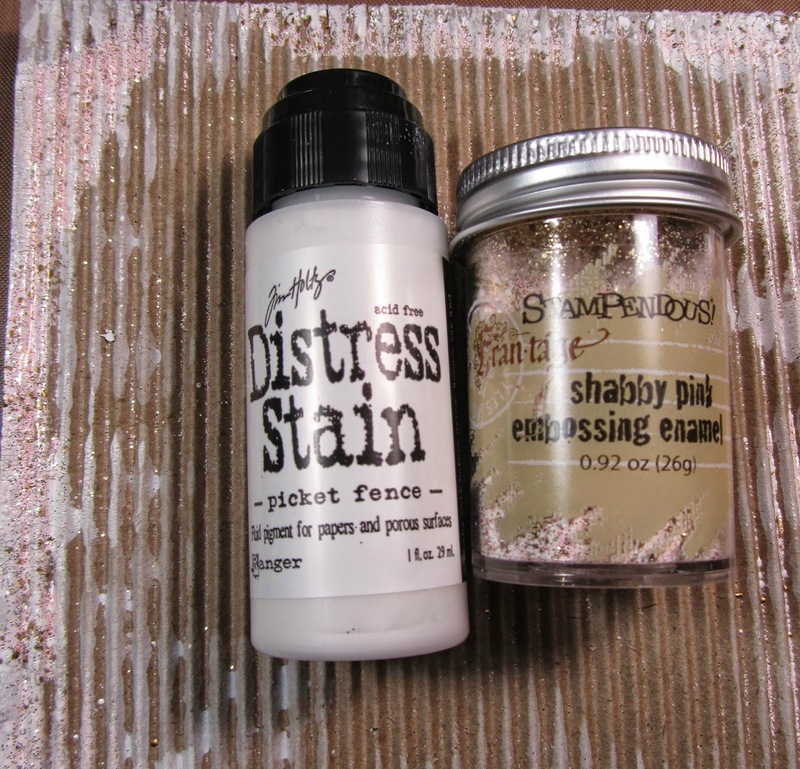 The rose was colored using Tim Holtz Distress Stains in Spun Sugar, Tattered Rose, Worn Lipstick and Barn Door. 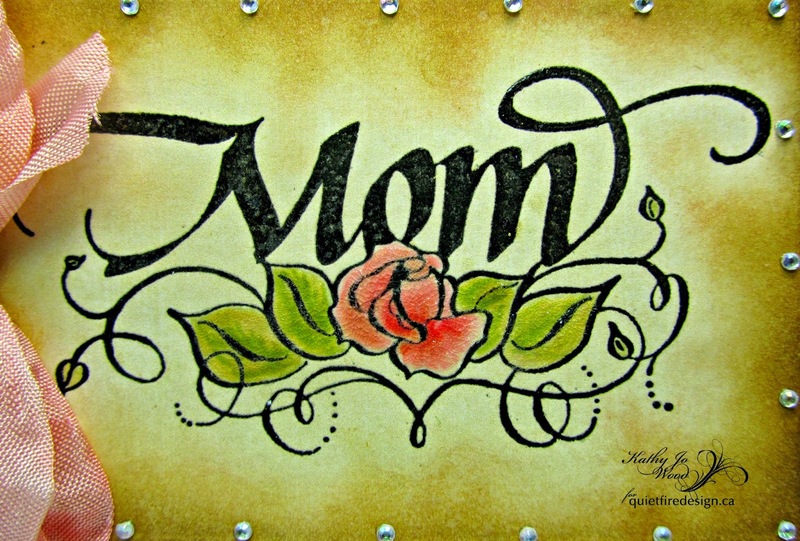 The petals were colored using Tim Holtz Stain in Crushed Olive and Peeled Paint. Distress inks in Antique Linen, Tea Dye, Vintage Photo and Walnut Stain were applied to the paper as shown. The image was die cut using Spellbinders Matting Basics and then the cutout had gold glimmer mist applied. Clear Crackle Paint was applied to the rose and larger petals. Closeup of stamped image and "crackle rose and leaves"
The ivory card base was die cut from the second largest die in the Spellbinders 5x7 Elegant Labels set. Before removing the die cut from the die, Spun Sugar was applied to the embossed areas. Paper die cut from Matting Basics was stained using Peeled Paint. Seam binding ribbon was dyed using the same Distress Stains used on the rose. Bling was applied around the Mom die cut and also to the crinkled double bow. Lovely set...and it is on sale right now for 20% off! Click here to see all of the stamps that are on sale at 20% off. and some aqua corrugated paper that i had in my stash. a bright satin bow and a dragonfly charm that i had. all have a really wonderful and crafty week. I have a card in the current issue of CardMaker Magazine, so they were sweet to send me a couple of complimentary copies. I'm also an advertiser in CardMaker, so I get a "complimentary" copy. 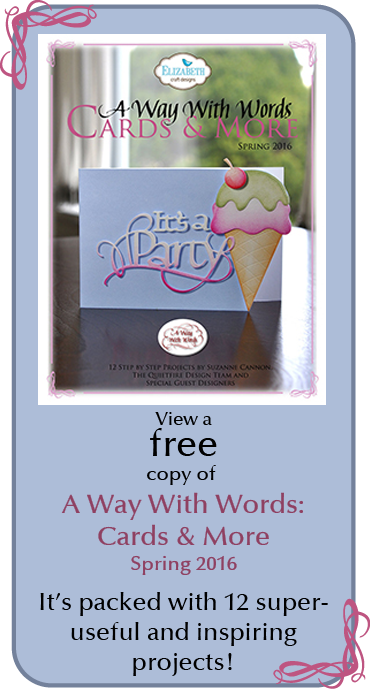 For some reason, this time I am inundated with love from CardMaker and have even more copies! So this is your chance to win! 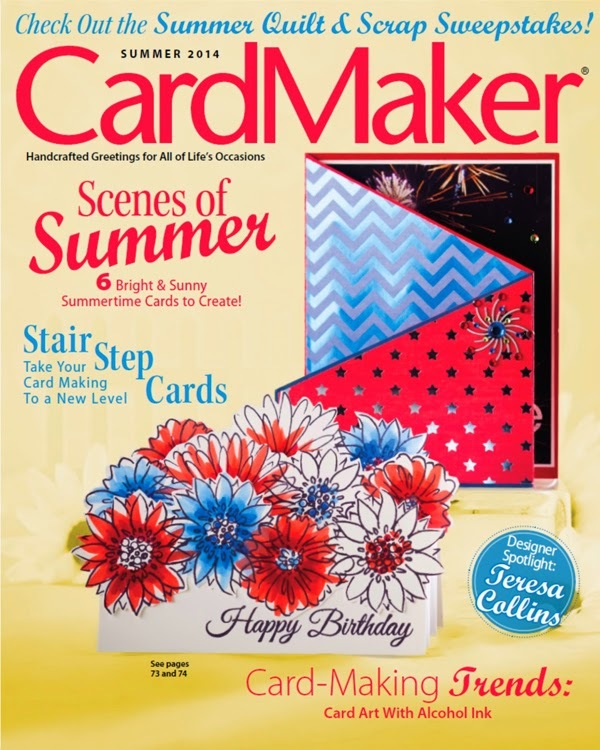 I'm giving away three copies of the Summer 2014 issue of CardMaker to three lucky winners! Follow the Rafflecopter instructions. Each time you accomplish a "task", you are entered again. So when you do everything, you can add up a bunch of opportunities to win! You may already follow us on Twitter and Facebook and subscribe to our newsletter, so that's easy points! Just click them off. (btw, I do check!) This week the sharing task is worth 2 entries! So make sure you tell your friends. Click here to see the card on YouTube! Yogi here today with a card structure I resurrected from several years back... I was rummaging in my Birthday card box for a card for a friend and came across a card with this structure. Since I was giving it away, I figured I'd better make another one to remember how to do it. BIG GRIN. 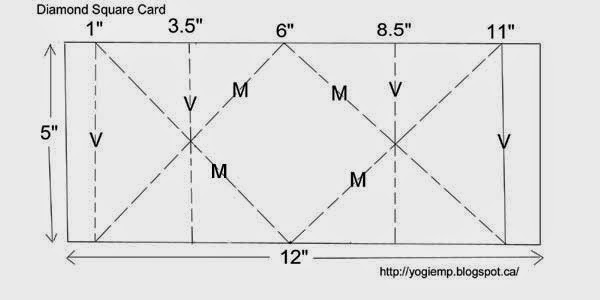 I cut a piece of green cardstock 5" x 12", scored it (See diagram below), placed a pencil mark at the 6" point, then creased the folds. Pinch the mountain (M) folds on the left side of card while pushing down on the valley fold, so that it creates an inverted type of triangle, so that it tucks under the central diamond square. Repeat on right side of card..
Cut 2 more pieces from the same green cardstock (2.5" x 5" ea) and adhered them to the backs of the flaps. Painted a stencil (Tim's "Stripes") using Distress Mini pads ("Mustard Seed", "Spiced Marmalade", "Salty Ocean", Mowed Lawn"), misted the stencil heavily and then stamped/pressed down onto watercolor paper (any smooth type will do, but I used Arches 90# HP). Leave the stencil on the paper for a minute, pressing down with a paper towel to absorb the excess that oozes out of the open areas. Carefully lift stencil and dry the paper. Trim to fit in the selected areas. 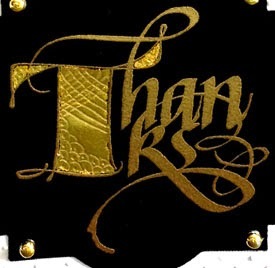 Stamp the quote (Gratitude is the Heart's...) with Versafine Black Onyx and clear emboss. Adhere some lace trim using a glue gun. Apply 5" w Sookwang tape to a piece of white cardstock. Remove the release paper and cover with Ritz Glitter micro fine "Cool Highlights". Burnish well, return excess to container then wipe off with a damp paper towel . 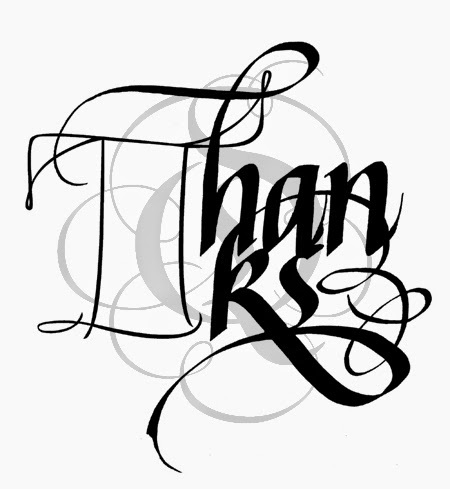 Stamp the "Thanks" with the black and clear emboss. NOTE: Careful Sookwang is not heat stable, so keep moving your heat gun to avoid hot spots. I used Derwent Inktense Watercolor Pencils and moved the color around with a wet paintbrush, wiping the brush on a clean paper towel to avoid muddying the colors. Allowed it to dry. Trimmed it down and adhered to square area of the front of my card. Getting out the Tidbits - Designer Tips! Tidbits. You know. Those tiny little pieces of paper that get stuck in your intricate cutting dies. Well the Design Team got started on that topic today and we burned up Yahoogroups with some great ideas and some perhaps not-so-great ideas for getting those bits out (depending if you don't mind whacking your dies or leaving residue on your paper). It all started with the fun video from Karen Burniston where, aside from the cool card she made, she shared a tip about placing your "full" die down on dryer sheets and running the die through your machine again. It's like magic! All the little tidbits come off on the dryer sheet. The part about the dryer sheets happens at about 5:30 in the video. If you're sensitive to smells, you might want to avoid this technique - maybe find the unscented version. Our Robyn Josephs says yes, it took out all the pieces, but then she couldn't get the pieces off the dryer sheet to use it again. Of course Spellbinders has their new tool which I have not tried yet, but seems there may be a learning curve to get the best results. Still, worth a try! Here is a link to their video about the new tool. It works in open dies. I always use my awl and have become very fast at poking! 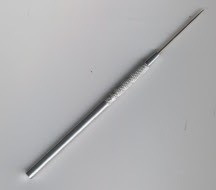 The awls may be found on the Quietfire website here. The medium awl is the perfect size for the holes. Robyn Josephs uses a baby toothbrush bought at a dollar store. She thinks the bristles might be a bit harder in the cheap brushes. She says they only cost a buck and she can choose her colour! Of course we were all trained by Spellbinders to use wax paper in our dies. It helps A LOT! Place the wax paper between the die and your paper before you put it through your machine. Jutta uses baking parchment in the same way as wax paper. One designer uses a pillar candle and rolls it across the top of their die. Hope this has given you some ideas and might help save time cleaning your dies - find what works best for you! Illuminations 1 Monogrammed Note Cards! Good morning! Sherry here today and I have a set of 4 monogrammed note cards to share with you. I have found myself in need of blank cards recently, that I could scribble a quick note in, so I decided to make myself a few. The cards are 4-1/4” square and use a cream card stock for the base. This leaves the inside clean so that I have somewhere to write a quick note. The designer paper used is Prima Stationer’s Desk. The background from Illuminations 1 was stamped in Antique Linen on white card stock, then die cut/embossed with Spellbinders Classic Squares SM. The initial “S” from Capital Letters, Double Stroke was stamped in cranberry pigment and then embossed with a polysparkle clear embossing powder. The edges of the initial panel were sponged with Antique Linen. A background layer for the initial was die cut/embossed from the Stationer’s Desk paper with Spellbinders Circles LG. The edges of this panel were distressed and then sponged with Antique Linen. The brown panel was die cut/embossed with Spellbinders Captivating Squares and then two square layers to fit inside were die cut/embossed from coordinating designer paper using Spellbinders Square LG. These squares were but in half on the diagonal, the edges were distress, sponged with Antique Linen and then sewn to the brown layer. All layer are raised with Scrapbook Adhesives 3D Foam Squares. That’s it for me today - - thanks for joining me!! 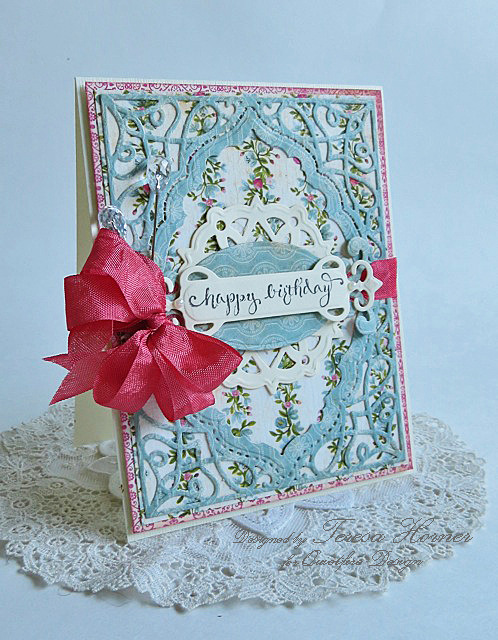 Holly shared her wet stencil technique and used one of our new stamps sets to make her beautiful card yesterday. So that's our giveaway this week! You may see "If You Don't Believe in Miracles" set here. Hi Everyone! Holly here today, and I'm happy to be showing you this card. Why? Because it has some of my favourite stamps on it! 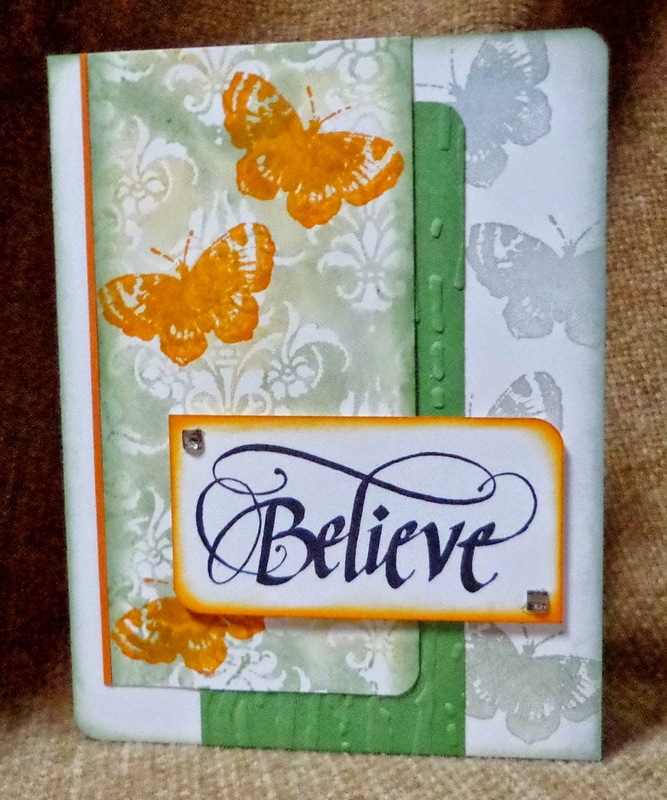 'Believe' is from one of the many fabulous new sets from Quietfire Design, called IF YOU DON'T BELIEVE IN MIRACLES, and the butterflies are from BUTTERFLIES/DRAGONFLIES. I use this set a lot. I used the wet stencil technique for the main panel with the bright wild honey butterflies, and sponged inks onto the stamp, for the base card butterflies. DISTRESS INKS worked beautifully for both areas. I pressed the ink pads directly onto the DAMASK stencil, then spritzed with water and laid the white card stock over it, allowing the inks to soak into the card stock. Lifted it and let it dry. Then, I stamped the small butterfly onto the panel, three times with wild honey ink. 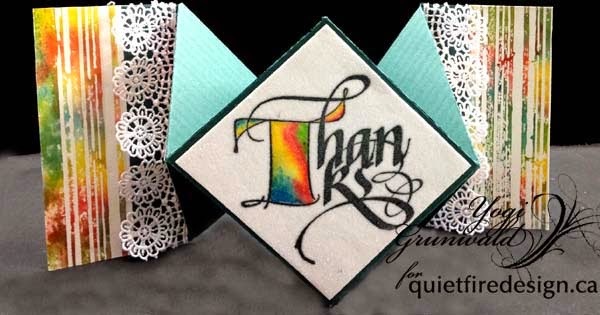 Two rounded corners and ink sponged around the edge, and square bling finish the sentiment piece. 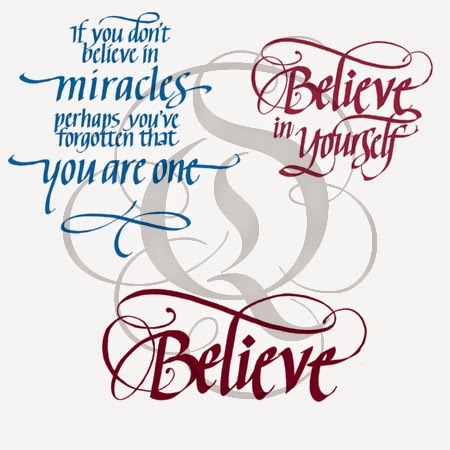 I believe this would make a great card for Grad, as the Believe in Yourself stamp from the set, could be used on the inside. So, there you have it- some favourites of mine! I just know I can't go wrong using any of them. Thank you so much for stopping by, and I hope you're having a fantastic, creative day! Hello! 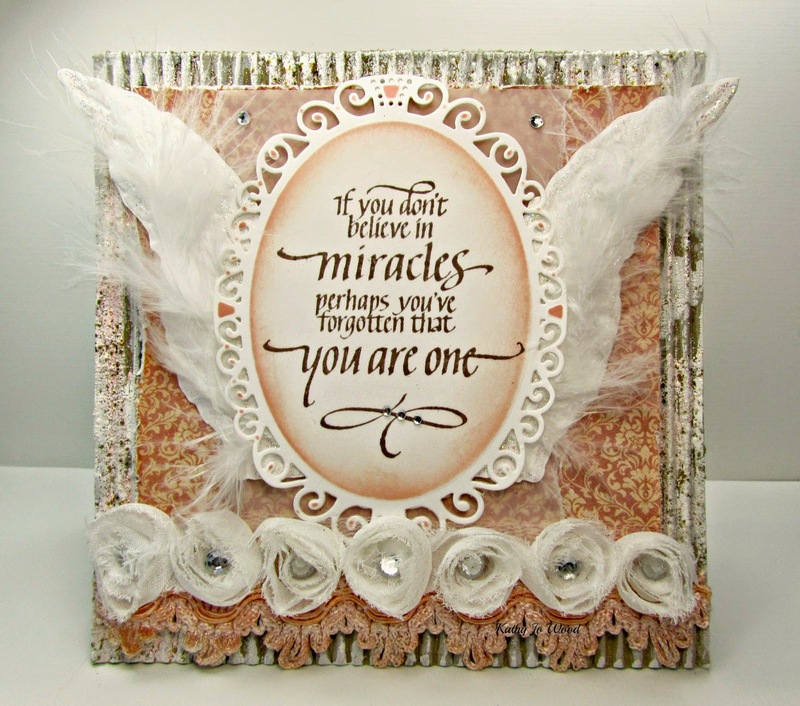 Kathy Jo here to share a shabby card using the gorgeous new set from Quietfire Design, If You Don't Believe in Miracles. It is such a beautiful set and it is also cling mount! Yay! Gotta love the cling! As soon as I saw this stamp I pictured wings on either side of it. 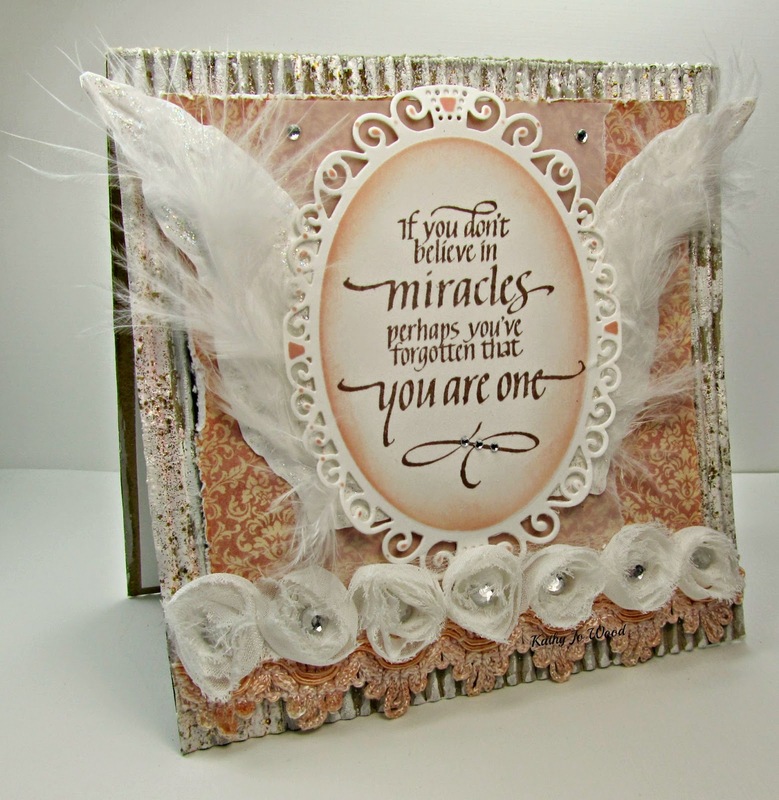 I used the Tim Holtz Texture Fades embossing folder from the set Flourish and Wings. Stickles was applied to the embossed areas. While it dried I applied Tim Holtz Distress Stain in Picket Fence to a corrugated card (Recollections). Next Versmark was randomly applied to the corrugation and then Stampendous' Shabby Pink embossing enamel was lightly sprinkled. It was a light sprinkling because the embossing is heated from the underside of the medium- if heated above, the glitter in the enamel blows everywhere! Heating through corrugation is also tricky so it is best to go thin. I cut a piece of Graphic 45's A Ladies Diary, distressed the edges and used scrapbooking glue to adhere to the front. Vellum paper was torn and applied to the middle of the G45 paper. By now the feathers were dry so I fussy them and adhered white feathers to them. Memento's Rich Cocoa was used to stamp the wonderful stamp If You Don't Believe in Miracles. 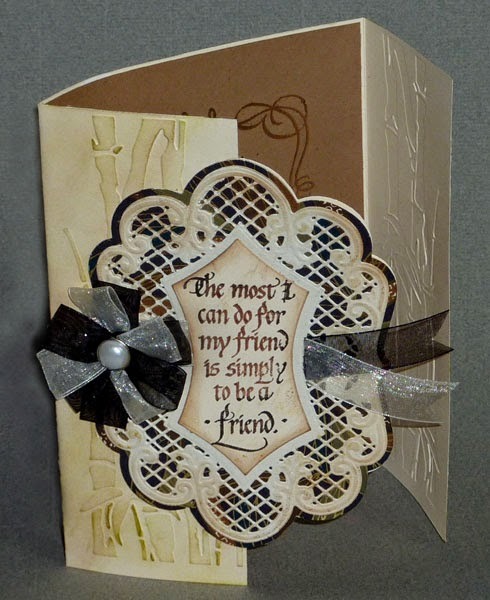 Spellbinders Elegant Ovals die cut the sentiment and while the paper was still in the die, Tim Holtz' Victorian Velvet ink was added as shown. The wings and die cut sentiment were foam taped to the card. Victorian Velvet stain was used on some old lace and then flower ribbon was adhered. In each lacy flower is a large gem. 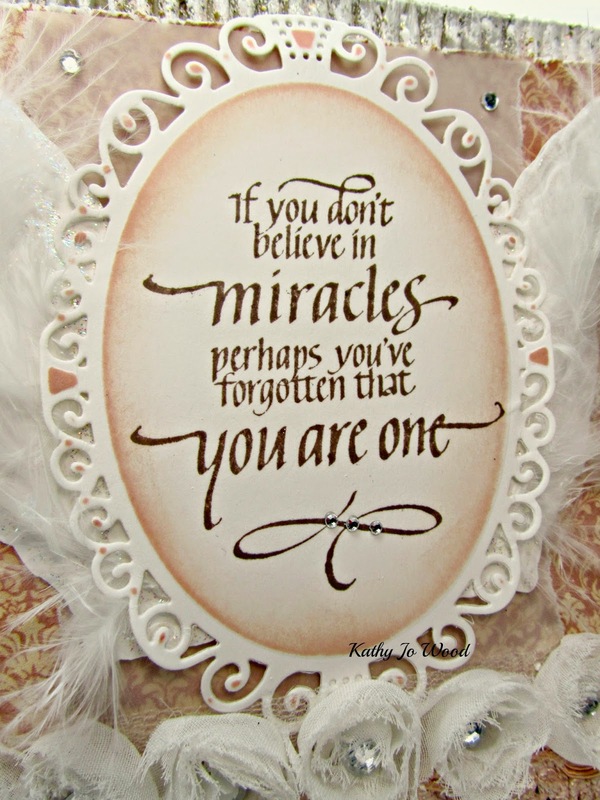 I hope you enjoyed the shabby card using the fabulous new If You Don't Believe in Miracles stamp! It comes in a set of three cling stamps...aren't they great? Thanks so much for stopping by! Have a good weekend! Fill 'er Up Thanks - Add Your Own Personality! We created Thanks - Fill 'er Up T for you to add your own unique expression to that big beautiful open space inside the T. This design is perfect for those who like to doodle, but not spend too much time on their projects. If you'd like to see more Fill 'er Up Cap designs, please let us know! We challenged the Design Team to share some of their ideas just in case you need to jump start your own creative engine, and here is what we came up with. The slide show will start on its own. Enjoy! Thanks for visiting! See you tomorrow when Kathy Jo will be sharing a beautiful new project with us! 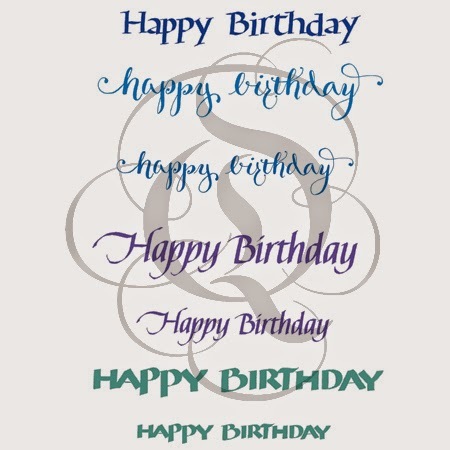 made using the cheery new Quietfire Design -Happy Birthday Plain & Simple stamp set. 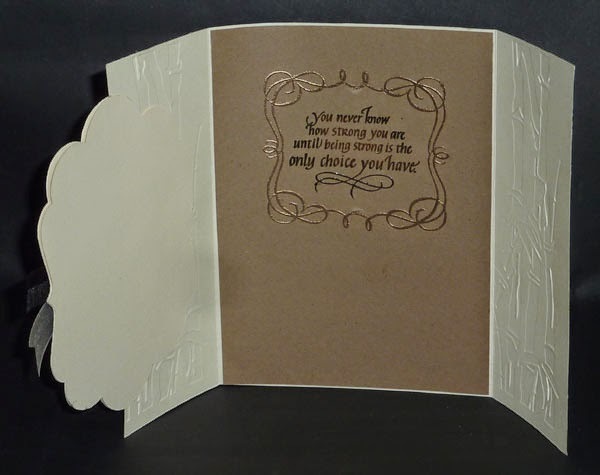 To make this card start with a 4-1/4"x 5-1/2" tent fold card base. Rearrange all but the very bottom stamp on the storage sheet. With repositionable tape adhere the entire storage sheet to a stamp block. Then using distress markers colour each stamp a different colour. Stamp all at once directly onto your card base. 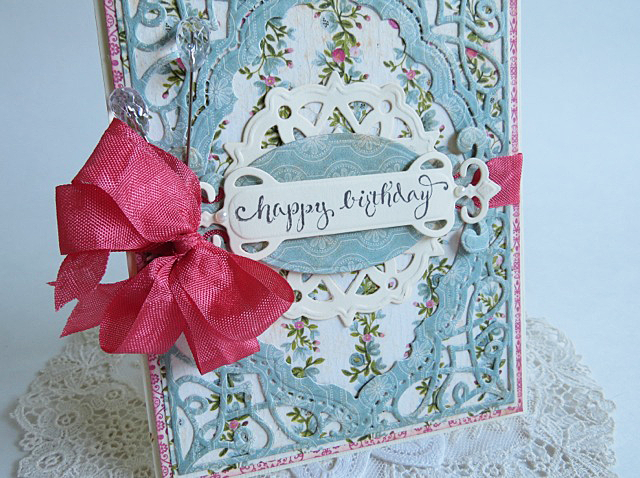 Add dots, matching colours to each stamped Happy Birthday. The final Happy Birthday is inked well and stamped bolder at bottom right. Colour pearls to match and attach randomly along dotted lines, see photo. To complete run the spiced marmalade distress marker all around edge of card base. Add ribbon to button then adhere to card base with glue dot. Tie ribbon around top of card. Extra tips: If you like the arrangement why not store stamps in that configuration then you are ready to go when it's time to make another card. 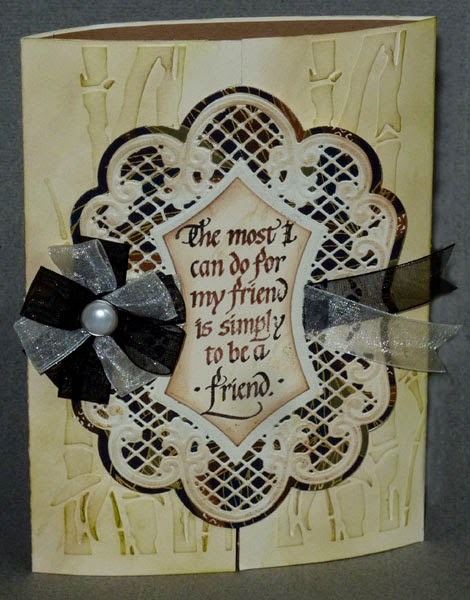 Use a variety of colours or go monochromatic the choice to personalize this card is almost endless. 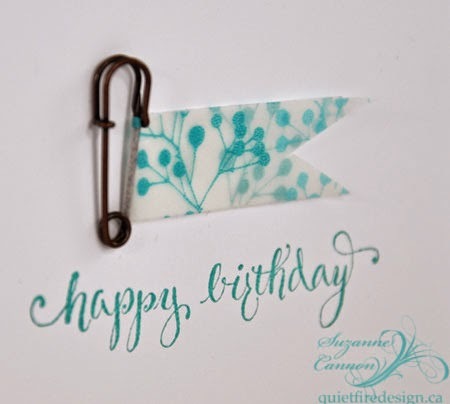 Quietfire Design -Happy Birthday Plain & Simple stamp set. Ranger Distress Ink - seedless preserves. White cardstock for base, Pearls and button. Be sure to enter the Tuesday-Winsday Draw this week for a chance to win these versatile set of stamps. Good luck and thanks for the visit! 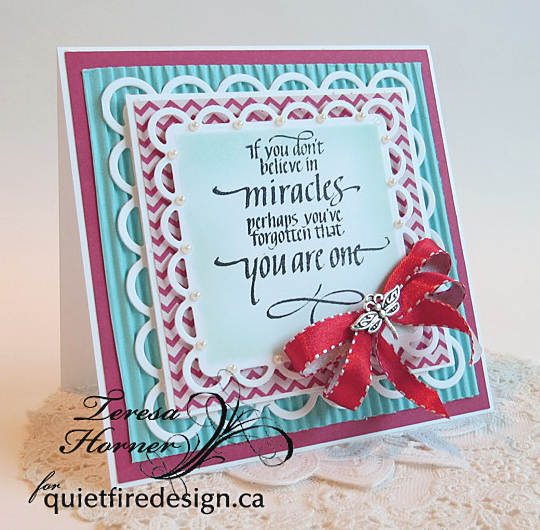 We're using Teresa's choice for her beautiful birthday card yesterday as this week's giveaway! It's one of our brand new sets - and the stamps are *mounted* with cling and foam - all 7 of them! You can see "Happy Birthday Plain & Simple set here. Follow the Rafflecopter instructions. Each time you accomplish a "task", you are entered again. So when you do everything, you can add up a bunch of opportunities to win! You may already follow us on Twitter and Facebook and subscribe to our newsletter, so that's easy points! This week the sharing task is worth 2 entries! So make sure you tell your friends. If you don't use Facebook, you can use your email address to enter - we don't share it, but it sure makes it a lot easier to contact our winners! Happy Birthday Plain and Simple and you can see it here. for her 99th birthday coming up next month. and layered it over 2 pieces of matching printed papers. running a pretty piece of bias ribbon in pink with a bow. even come on a special adhesive card for storage. more of them with you this month. 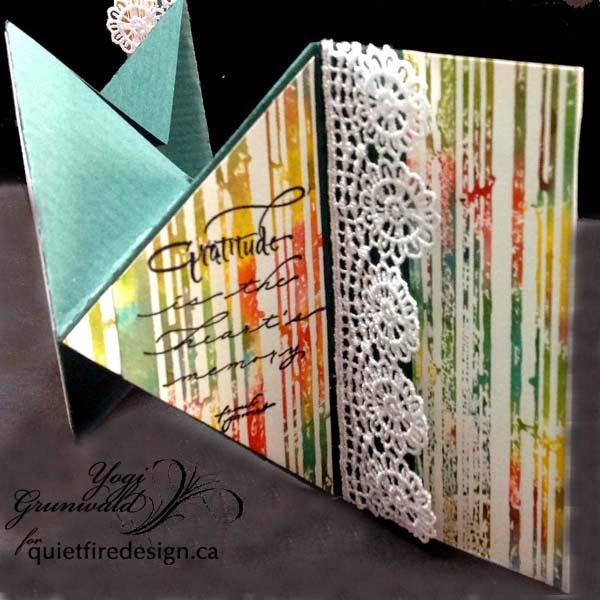 Yogi here today with a gate fold card and a multi-looped bow. I scored my cream cardstock at the 2.5" and the 7.5" points, then trimmed down the center where the sides meet to get a perfect fit. Embossed both sides with Cuttlebug "Bamboo" 5 x 7" embossing folder, using the "off the edge" technique to only emboss the front of the card on the right flap. Lightly sponged Distress Crushed Olive over the high points. Die cut the lattice piece from cream cardstock and used the rubber mat to emboss the designs as well. Lightly sponged using my dirty brown sponge over the edges. Die cut the underlayer from Chyiogami paper (fall colors/leaf pattern) and adhered to my lattice piece. Stamped the quote with Versafine Vintage Photo and touched areas with Black Onyx, clear embossed and die cut with the center die of the set. Sponged again with my dirty brown sponge and adhered to lattice piece. Cut another cream toned underlayer piece and adhered to lattice assembly. Adhered the lattice assembly to the front of the left side. Cut another cream toned underlayer and adhered it to the inside of the card, matching the edges and only adhering to the front flap edge. This leaves a pocket type opening for the right side flap to fit into to keep card closed. Created my bow by making several loops from black and cream toned gauze ribbon. Cut ribbon to 4", adhere to form a loop with a small piece of Sookwang tape. I used a piece of thin string to pinch the first few loops in the center to give more of a bow look, tying the string in the back. Used an awl to pierce my bow in the middle and inserted my pearl brad. Kept stacking the loops, arranging them in a circle pattern. Punched out a 3/4" circle for the base. Opened my brad points then adhered the circle to the card. Cut a couple tail ends of ribbon and adhered them to the front with some Sookwang tap, trimming them to fit the contour of the design. (should have cut a slit and stuffed them under... hindsight). Cut ends into fishtails. On a piece of brownish Kraft cardstock, stamp the left part of the frame with Versafine Toffee using a stamp positioner and some tape on the stamp as a mask. Ink the stamp, remove the tape and stamp. Emboss with Queen's Gold. Stamp the right side of the frame in a similar way using the stamp positioner. Stamp the quote using Versafine Vintage Sepia and touching areas with Black Onyx, clear emboss. Trim cardstock down and adhere to inside of card. Hey there! It's Suzanne today with a super simple birthday card to share! I've been dying to play with this washi tape and since the name of the new stamp set is Happy Birthday Plain and Simple, I thought this was such a simple design that it fit the bill. Once I found my stash of little kilt pins, this card took me about 5 minutes. I'm not use to mounted stamps and it's different than using them on Tack n Peel, so I needed to practice a few times. The mounted stamps also sit higher when I use the stamp positioner, so that took a bit of practice, too. Quietfire "Happy Birthday Plain & Simple"
Cut a piece of white cardstock to 10" x 5" and fold in half to create a 5" x 7" card. Open the pin. Cut a 5" piece of washi tape and fold it around the open pin shaft adhering the tape to itself. Trim the tape ends into a V as shown. Close the pin. Stamp "Happy Birthday". You can use whatever ink colour compliments your washi tape. 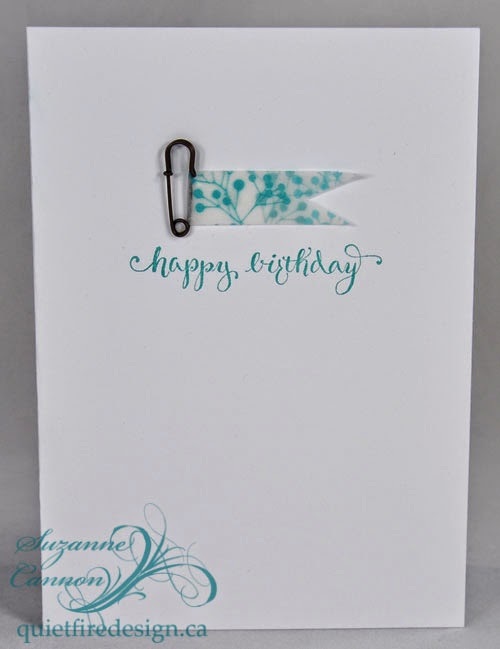 Use a single Glue Dot to adhere the pennant and pin to the card as shown. Quick and cute! Thanks for stopping by! Tuesday Winsday - Thanks with a Fill 'er Up Cap! Thanks - Fill 'er up with Tangles!